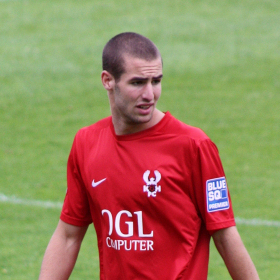 After just one season with the Harriers our star winger Matty Blair, has left the club to join fellow Blues Square side York City. Rumours earlier in the week had linked him with newly promoted AFC Wimbledon but that appeared not to be the case although it would have made more sense than this sideways move to a club that have been perennial under achievers for many years now. Matty joined us from AFC Telford at the start of last season and originally came in on a short three month contract but, after proving himself with his pacey play down the right, the contract was extended until the end of the season. Was that a big mistake on our part? He soon started to produce 'the goods' and the culmination of that was a stunning hat trick against Grimsby towards the end of the season. Add in the other eight goals he scored for us in forty five games and it was obvious that the Harriers manager, Steve Burr, had un-earthed a good 'un. It's not known what kind of offer we had made him but I would assume that it would be the same two years that City have given him but with not so much money maybe. I would have thought that a bit more judicious financial juggling would have made any offer from us more competitive but we'll never know. At least we should get a fee for him although it will no doubt be un-disclosed. "Kidderminster gave me my chance but we feel that this club now is the club for me to go further..........I felt I owed Kidderminster a lot"
"On the other hand my dad advised me well. It was a really difficult decision because the fans at Kidderminster made me feel brilliant. They encouraged me all the way but I'm hoping to get that here as well. "I can't praise Kidderminster highly enough but unfortunately the terms and everything else weren't quite as good so I feel that this is the right move and I'm looking forward to it."